Description: The lemon sole is a right-eyed flatfish which is similar in shape to the dab but has a smoother and more slimy skin and a fleshier body. The head and mouth are very small hence the name Microstomus which is latin for small mouth. The upper surface is mottled red-brown, pink and orange with flecks of yellow and green. Usually there is a large orange blotch behind the pectoral fin. The underside is white. Adult fish can reach a maximum length of 70cm however most are between 20-30cm. Habitat: Lemon sole are bottom-living fish that live mainly in rocky or stony areas in depths between 5-400m. They feed on small crustaceans, scale-worms and chitons. Distribution: All around the coasts of Britain and Ireland. Similar Species: The lemon sole is similar in shape to the dab but has a smoother, more slimy and more colourful skin. 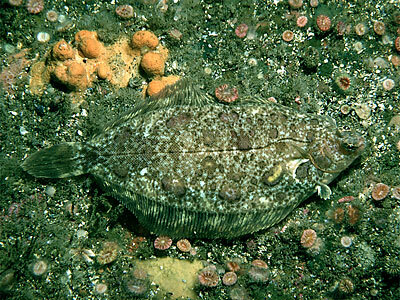 The only other flatfish likely to be encountered on rocky surfaces are the topknots, however these are all left-eyed. Picton, B.E. & Morrow, C.C. (2016). Microstomus kitt (Walbaum, 1792). [In] Encyclopedia of Marine Life of Britain and Ireland.